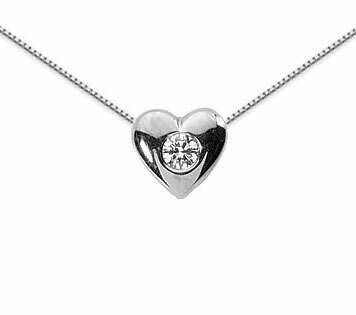 True love is always in style and so is this classy heart pendant. This simple but sophisticated style serves as a versatile statement of your affection, and it works equally well with dressy ensembles as it does with casual attire. This 14K white gold heart hangs elegantly from an 18-inch box chain as it displays a 0.20 carat round diamond. This petite, highly-polished piece is a timeless symbol of love that will look just as beautiful years from now as it does today. We guarantee our 0.20 Carat Diamond Solitaire Pendant, 14K White Gold to be high quality, authentic jewelry, as described above.